Many of you would have noticed has been a busy year for Mudlet. Here’s a recap! Mudlet enables you to play text RPG games, aka MUDs. Such online games have been polishing the player experience for decades and are an awesome alternative to mainstream games. Mudlet hasn’t been slack and has been polishing the player experience as well! The first thing new users see about Mudlet is, arguably, the website – and ours was 8 years old. Thanks to the efforts of itsTheFae, Mudlet now has a new, modern website that brings it into the modern age. Continuing the theme of a better first impression, vadi2 ditched the old wizard-based installer for Windows because that was so 2000’s. The new Windows installer doesn’t require admin privs, no “next” buttons, and installs Muldet in under 5s. On Linux, thanks to the available AppImage technology, we were able to go a step further. We ditched the wizard-based installer as well and replaced it with a version of Mudlet that can run straight out of the box, no installation needed. Mudlet on macOS already has been a super-convenient .dmg for years and that’s as good as it gets! Same goes for code. Got a confusing error message? Select, right-click, Google. gilmoa added this awesome feature. MUDs are a worldwide phenomenon with games out there in Spanish, Polish, Chinese, Russian, Italian, … you name it. SlySven has been putting in a ton of work to bring Mudlet to the international arena. Mudlet can now understand and show other encodings such as those for Spanish and Russian, and display of other alphabets like Chinese is something that’ll come. 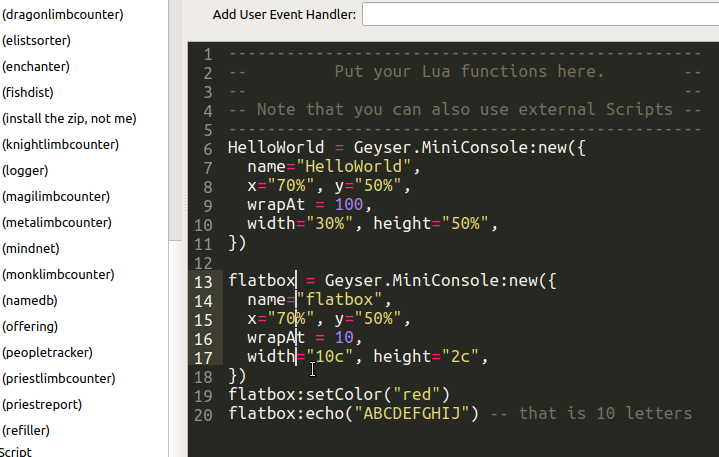 The Lua environment has also been updated with functions to be able to work on international text. Overall, i18n is still a work in progress, but a ton of progress has been achieved so far. A fun part of playing MUDs is also learning how to code dinky scripts that do your bidding. We’ve improved the experience and are adding more IDE features to Mudlet! tomcss took it upon himself to replace the old code editor in Mudlet with edbee, made by gamecreature. Edbee supports multiple cursors, highlights text better, handy shortcuts for manipulating text, and, of course, themes! Want to make your Mudlet look like Sublime Text? You can! Just pick the Monokai theme. That theme and 350+ other themes from ColorSublime are available for use. Credits to dicene and vadi2 for making this happen! You can now select the prompt as a trigger pattern for your scripts! In addition, you can use it from scripts via tempPromptTrigger(), as well – credits to vadi2. This feature is for the professionals out there – all of Mudlets API now supports coroutines, which open up new avenues for design and help you create state machines. Props to ahmedcharles for working that out! All of the triggers you can create in your scripts – tempTrigger, tempRegexTrigger, and so on – can now take a function to run as well as Lua code as a string. Previously, if you wanted a trigger to run a function, you’d have to do tempTrigger(“pattern”, “myfunction()”) – now you can just do tempTrigger(“pattern”, myfunction). This lets you use local functions, lets you capture variables easier, and in general simplify your scripting – a feature added by vadi2. keneanung added a similar feature to events. SlySven has put his signature thorough touch on the mapper, optimising it and making it more consistent in what it allowed. Duplicate area names, unnamed areas, rooms in areas that don’t exist and so on are longer possible to create. 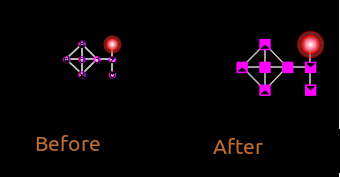 In addition to that, Mudlet will also automatically fix up your map should it have any of the dodgy things in it. Tired of looking at other people’s messy scripts? Have some messy scripts of your own? Right-click on it and select Format All. Bam, magic. It’ll turn your mess into something beautiful. Can’t speak for the code quality itself, though. vadi2 integrated martin-eden‘s Lua formatter to make this happen. WackyWormer added nice features for UI customisation: toggling scrollbars on miniconsoles, double-click, mouse move and scrollwheel events, and the ability to see what keys are pressed as well.